Product #18691 | SKU LP36282 | 0.0 (no ratings yet) Thanks for your rating! The Lowepro S&F Technical Harness (Black) is designed for a photojournalist or photographer who needs go light and move fast when covering an event. This lightweight, supportive and flexible design must be worn with the Lowepro S&F Light Utility Belt or the S&F Deluxe Technical Belt to relieve the weight of heavier loads. It also fits a Street & Field #13 Deluxe Waistbelt, large. It is made from 600 denier polyester, 1680 denier nylon, 420 denier AZ Dobby nylon and Dry Flo mesh outer fabrics. 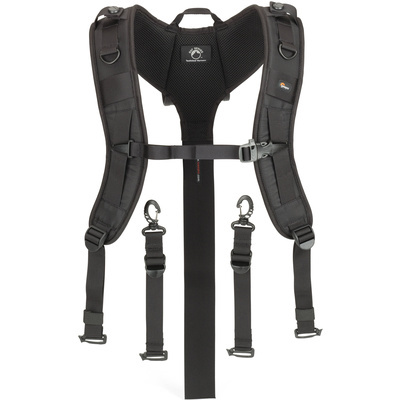 The S&F technical Harness uses SlipLock attachment loops to allow the attachment of compatible S&F or Lowepro SlipLock products. There are lapel strap keepers that secure a camera strap to the harness at the shoulders via a sturdy snap which fully integrates with optional S&F Utility Laptop Backpack 100 AW to create a comprehensive working system. It is ideal for a sports photographer or journalist, when the backpack is attached to the harness with a belt via straps and SlipLock loops. A detachable handle cup and restraint straps quickly convert the harness to a backpack allowing the photographer to carry an additional Lowepro shoulder bag. There is a sternum strap with built-in safety whistle that adjusts for a comfortable, snug fit.